Peamount Healthcare’s Neurological Serviceprovides long term residential care for adults under 65 with an acquired brain injury or progressive neurological illness such as MS and Motor Neuron Disease. The Service, based in St. Brid’s unit, has 21 beds. Our philosophy is to deliver the highest standard of nursing care to residents in an environment similar to their home setting. The nursing staff are experienced in neurology, high dependency and the management of young adults with physical disabilities. Residents who are under 65 can be referred to the Service from any hospital following the post acute phase of their rehabilitation. Referrals are also accepted from GPs, Social Workers and Public Health Nurses within the community. A consultant led multi-disciplinary team including medical, nursing, health care attendants, occupational therapy, physiotherapy, speech & language therapy, pharmacy, social work, audiology and dietetics provide support to this unit. 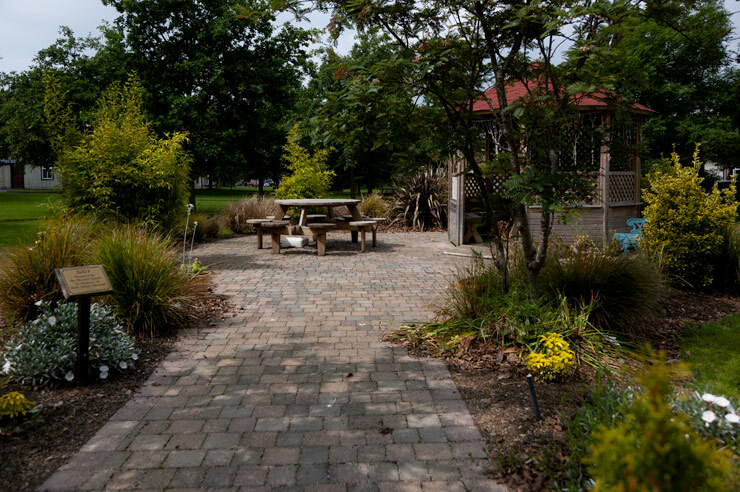 An End of Life Palliative Care Programme in conjunction with the Irish Hospice Foundation helps ensure that residents can pass away pain free, with dignity and in the company of loved ones and staff who have helped and understood them. Residents in the Service are also supported by the Recreational Department and its range of activities including Art, Computers, Drama, Yoga and Thai Chai and a library. GPs, Social Workers and Public Health Nurses submit an application form for referrals. All applications are reviewed and the applicant is assessed at their hospital or home to determine their suitability for admission. It is recommended that prospective residents and their families visit the Neurological Service Unit before any referral is made. The Intellectual Disability Service in Peamount Healthcareprovides long-term residential care for people with an intellectual disability. Service Users live in the community and on Campus. The Service provides an improved quality of life for its Service Users aimed at helping to maximise independence, self determination and dignity. Peamount’s Intellectual Disability Service encourages people to develop their living and social skills, empowers them to lead richer, fuller lives and to integrate within the community. The Service is driven by values of equality, the right of individuals to be part of the community, to plan for their own lives and to get the personal supports they require. This is consistent with public policy to support initiatives to move people with disabilities from congregated settings. On-campus accommodation is provided in residential bungalows and two high dependency units for those with more complex needs. Community accommodation is offered by Peamount Housing Ltd. in houses and apartments in nearby towns. A highly qualified multi-disciplinary team that includes nursing, physiotherapy, occupational therapy, social work, pharmacy, speech & language therapy, dietetics and an independent advocate works with the Service Users. The Service is also supported by a Consultant Psychiatrist with a special interest in intellectual disability and a local GP service. Palliative and end of life care is a particular expertise of the Service. The high dependency unit has a specifically trained Palliative Care Nurse working with staff to ensure the comfort and dignity of residents who are nearing end of life. This is greatly appreciated by relatives of Service Users. Day Services are the main focal point for most Service Users’ activities. Service Users develop practical skills here such as cookery, household management, shopping, health and hygiene, computer and telephone skills to help them integrate within the wider community. Other activities include horticulture, pottery, woodwork, photography, art, drama, various crafts, sports, dancing and outings. The Service has its own Advocacy Group, supported by the National Advocacy Service, and developed and designed by the Service Users and supported by staff from Day Services and Speech and Language Therapy. Peamount Intellectual Disability Service is not currently accepting referrals. Residential careis provided to men and women over 65 who can no longer live in their own homes. Residents have illnesses such as Dementia, Arthritis, Stroke, Respiratory and Orthopaedic conditions. 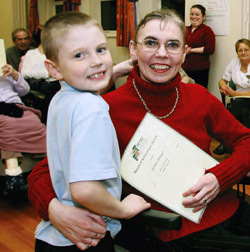 The Service provides a safe, homely environment which promotes residents’ privacy and dignity. Residents’ avail of a range of clinical, social and recreational services to help them live as independently as possible on campus. Residents are referred from the acute hospital sector, mainly AMNCH (Tallaght) Hospital, St James’s Hospital, and from the community through General Practitioners, Public Health Nurses, and Social Workers. There are up to 50 Age Related Residents in two residential units, St. Patrick’s and St. Ciaran’s, on Campus. Residents are admitted under the care of a Consultant Geriatrician. Care is provided by Nursing staff with the assistance of Health Care Attendants and with access to Clinical Nurse Specialists. Nurses and Health Care Attendants work together to ensure that each resident’s needs are assessed and an individualised Care Plan is developed. Residents can avail of Physiotherapy, Occupational Therapy, Speech and Language Therapy, Social Workers and a Nutritionist on a referral basis. The Service also has access to a Consultant in Psychiatry of Later Life. Many of the residents participate in art, computer studies, creative writing and drama in Peamount Healthcare’s Recreation Department. Volunteers play a key role in these services. A policy of open visiting is offered at Peamount ending at 9.30 pm. Relatives are encouraged to visit and join in parties and events. Each unit has a Resident’s Group, a forum to give residents (and family members), an opportunity to participate in decisions that affect them. Admission to residential care to Peamount Healthcare is facilitated by the Local Placement Forum (LPF) which processes all applications based on a Common Summary Assessment Report (CSAR) from the relevant health professionals (see above).